Does yoga keep you fit? When it came to the fitness benefits yoga can or can’t provide, yoga teacher John Schumacher had heard it all. 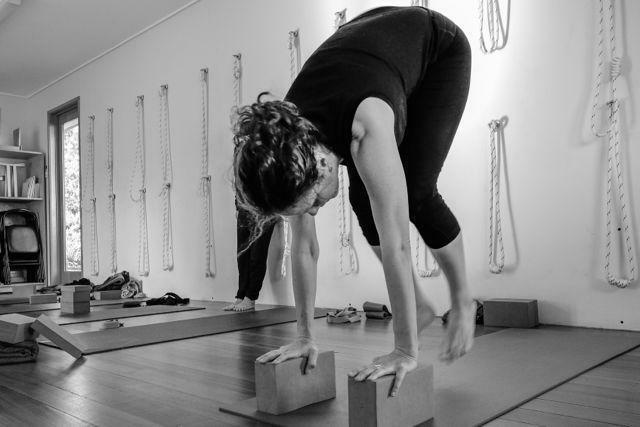 A student of B. K. S. Iyengar for 20 years and founder of the Unity Woods studios in the Washington, D.C. area, Schumacher was convinced yoga provides a complete fitness regime. But many people, even some of his own students, disagreed. Yoga might be good for flexibility or relaxation, they’d say, but to be truly fit, you had to combine it with an activity like running or weight lifting. Schumacher just didn’t buy it. He knew three decades of yoga practice—and only yoga practice—had kept him fit. He didn’t need to power walk. He didn’t need to lift weights. His fitness formula consisted of daily asanas (poses) and pranayama (breath work). That’s all he needed. Evidence of yoga’s ability to bolster fitness, however, goes well beyond Schumacher’s personal experience. Yoga Journal’s testing of three yogis also yielded impressive results. Even physiologists who don’t do yoga now agree that the practice provides benefits well beyond flexibility and relaxation. Research [in 2006] —though preliminary—shows that yoga may also improve strength, aerobic capacity, and lung function. If you practice yoga, you already knew that. But if, like Schumacher, you’ve been told by friends, family, doctors, or even other yoga students that you need to add some power walking for your heart or strength training for your muscles, here’s evidence that yoga is all you need for a fit mind and body. In one of the first studies done in the United States that examines the relationship between yoga and fitness, researchers at the University of California at Davis tested the muscular strength and endurance, flexibility, cardiorespiratory fitness, body composition, and lung function of 10 college students before and after eight weeks of yoga training. Each week, the students attended four sessions that included 10 minutes of pranayama, 15 minutes of warm-up exercises, 50 minutes of asanas, and 10 minutes of meditation. After eight weeks, the students’ muscular strength had increased by as much as 31 percent, muscular endurance by 57 percent, flexibility by as much as 188 percent, and VO2max by 7 percent—a very respectable increase, given the brevity of the experiment. Study coauthor Ezra A. Amsterdam, M.D., suspects that VO2max might have increased more had the study lasted longer than eight weeks. In fact, the ACSM recommends that exercise research last a minimum of 15 to 20 weeks, because it usually takes that long to see VO2max improvements. “It was very surprising that we saw these changes in VO2max in such a short time,” says Amsterdam, professor of internal medicine (cardiology) and director of the coronary care unit at the U. C. Davis Medical Center in Sacramento. He is now considering a longer, larger study to authenticate these results. A related study done at Ball State University offers further evidence for yoga’s fitness benefits. This research looked at how 15 weeks of twice-weekly yoga classes affected the lung capacity of 287 college students. All of the students involved, including athletes, asthmatics, and smokers, significantly improved lung capacity by the end of the semester. “The athletes were the ones who were the most surprised, because they thought their athletic training in swimming or football or basketball had already boosted their lung capacity to the maximum,” says study author Dee Ann Birkel, an emeritus professor at Ball State’s School of Physical Education. Exactly how does yoga build fitness? The answer you get depends on whom you ask. Robert Holly, Ph.D., a senior lecturer in the Department of Exercise Biology at U. C. Davis and one of the researchers on the U. C. Davis study, says that muscles respond to stretching by becoming larger and capable of extracting and using more oxygen more quickly. In other words, side benefits of flexibility include increased muscle strength and endurance. “My own belief is that the small but significant increase in maximal oxygen capacity was due to an increase in muscle endurance, which allowed the subjects to exercise longer, extract more oxygen, and reach an increased maximal oxygen uptake,” says Holly. Then there’s the pranayama theory. Birkel suspects that yoga poses help increase lung capacity by improving the flexibility of the rib area, shoulders, and back, allowing the lungs to expand more fully. Breath work further boosts lung capacity—and possibly also VO2max—by conditioning the diaphragm and helping to more fully oxygenate the blood. This is an edited version of a story that first appeared in The Yoga Journal. You can read the full article here.